A lot of people are nervous about driving in Portugal for the first time, but it’s actually not that bad. Sure, indicating isn’t all that common, people do drive bumper-to-bumper, and Portugal does have one of the highest accident rates in Western Europe, but it’s actually alright. In fact, Portugal can be a very enjoyable place to drive. A lot depends on what you’re used to. If you normally drive in the UK, Germany, or the USA, you may find the driving in Portugal slightly erratic and disorganised. If you’re used to driving in other parts of Europe, and especially in other parts of the world, driving in Portugal will be very manageable. 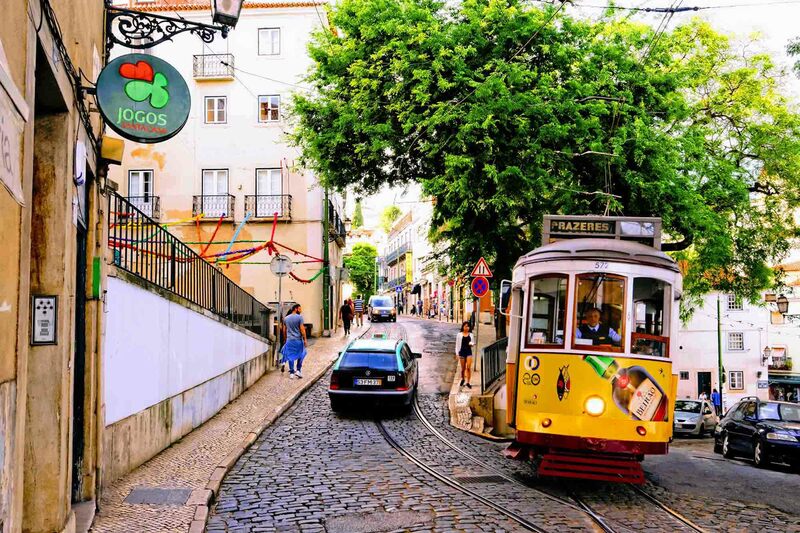 The following are just a few rules, tips, and safety pointers for driving in Portugal. You’ll need to make sure the following items are in your car whenever you’re driving. Driving licence with photo ID (if your driving licence doesn’t have a photograph, you’ll need to get an international driving permit). Permission slip showing that you have permission to drive that car (templates are available from Afpop). Note: you’re supposed to carry photo ID on you at all times, regardless of whether you’re driving or not. You can get breakdown kits on amazon.co.uk or amazon.es. If you’re bringing your dog with you in the car, the dog needs to be kept from getting into the front of the car and interfering with you driving. A restraining lead that clips to the seatbelt (available on amazon.co.uk or amazon.es). A travel kennel or crate. It’s always a good idea to have GPS in your car, not just for long journeys but also for getting you out of confusing cities. That isn’t necessarily just Lisbon or Porto, even smaller cities like Portimão in the Algarve can be confusing to drive around. These days, it’s no longer necessary to buy a Sat Nav as most there are great GPS apps like Scout for both Android and iOS. Google Maps and Waze are also fantastic, although you normally need to have a 3G connection to use them (you don’t need a 3G connection for Scout). If you’re renting a car, you can normally hire a GPS unit from the car rental company if you don’t want to rely on your phone. Although this is more expensive than just downloading an app, it’s often easier to use and may be better for the “technologically impaired”. It’s also a good to have a GPS app on your phone that can display your GPS coordinates. I’ve broken down in Spain in the middle of nowhere and, with no recognisable landmarks nearby, and wasn’t really able to tell the roadside assistance where to come and find me. Although that’s more of an issue in Spain than in Portugal, I’ve since installed an app that gives me my GPS coordinates just in case that ever happens again. Portuguese drivers don’t really like to indicate unless it’s absolutely necessary. Keep an eye on the drivers around you, and assume that they won’t really give you any warning of what they’re about to do. For whatever reason, they especially don’t like to indicate when coming off or going onto roundabouts or when overtaking you (although sometimes they’ll indicate after they’ve dangerously overtaken you and an accident is looking likely). Portuguese drivers like to get up close and personal when they’re driving, and sometimes it feels like you’re driving bumper-to-bumper. This isn’t necessarily aggressive (unless you’re blocking up the overtaking lane, in which case it probably is), it’s just that they can’t handle seeing an empty space between two cars. If you want to stop this, your best option is to first check that there’s space in front and then to slow down a little. This tends to annoy Portuguese drivers, but only enough that they’ll overtake you and take that space in front of you. Of course, then someone else will then come up behind you and get bumper to bumper and the whole process starts again. Note: Don’t slam on the brakes suddenly as some people like to do. Although this gets your point across, it’s very dangerous and could result in you getting rear-ended by the driver behind you. Although you may be driving at the speed limit, maybe you’re even driving over it, you’re not going to be going fast enough for some Portuguese drivers. There are just some drivers here who can’t stand the thought of being behind another car, even if the car in front is speeding as well. Just accept it, slow down, and let them overtake you. Although there are speed limits on the roads in Portugal, you’ll rarely see speed cameras or police to enforce them. That’s not to say there aren’t occasionally speed cameras or hidden police; it’s just that they’re not that common. It also doesn’t mean that everyone speeds in Portugal: some people keep to the speed limit and some drivers (particularly older drivers) stay well below it. If you’ve held your driving licence for less than one year, you shouldn’t go faster than 90 km/h (although this is rarely enforced). Although Portugal has very strict drink driving laws, that doesn’t mean that it doesn’t happen. In fact, it can be very common in rural parts of Portugal. That doesn’t mean that you should “do as the locals do”, however: two drunk drivers are a lot more likely to cause an accident than just one. In Portugal, the law is that you can have no more than 50 mg of alcohol in 100 ml of blood. Learner, novice, and commercial drivers can only have 20 mg which essentially means they shouldn’t drink. You’ll see a lot of interesting vehicles on Portuguese roads, but three of the most interesting are the sigano (gypsy) horse and carts, Aixam cars, and Piaggio Ape vehicles. Those last two are normally below 125 CC, which means they can legally be driven without a licence in some conditions and on some rural roads. You’ll often see them driving half in the ditch and half on the road. This is partly because they can’t get up the same speed as a normal car, but also because they’re legally not allowed to drive on some roads (and keep half the car in the ditch is some kind of legal grey area). You’ll also see a lot of beaten up, barely road-legal cars in rural parts of Portugal. These aren’t a big deal during the day, but can be a problem at night particularly if they’re missing a light or two. Normally, when you join a motorway, there’s a long slipway where you can get up speed and join the motorway at roughly the same speed as the other cars. This isn’t always the case in Portugal. In Portugal, motor slipways are often incredibly short and are more like a T-junction (sometimes called a 3-way intersection) than a motorway slipway. If there’s a lot of traffic on the motorway, you’ll actually have to stop your car, join the motorway, and then get up to speed. Another unique feature on Portuguese roads is that the motorway exit and entrance are right next to each other – often just 100-150 metres apart – and are part of the same piece of road. As you come off the road, you’ll pull into the “coming off lane” but this also happens to be the “joining the motorway lane”. To avoid an accident, you don’t want to come off to early otherwise you risk coming into contact with someone that’s joining the motorway. Don’t pull in to early, keep an eye out for cars that are joining the motorway, and don’t join it until you can see that it’s safe to do so. Driving in cities, especially Lisbon and Porto, is tough and not recommended. The streets are narrow, incredibly steep, and often you’ll not only be sharing the road with other cars, but also buses and trams. Tourists often tend to walk out in front of cars as well, particularly if the traffic is moving slowly. It can also be very difficult to park in Portuguese cities, particularly if you have a large car. Parallel parking is an important skill to have, and you’ll often have to combine it with parking on a hill. Portugal isn’t sunny all of the time. In fact, large parts of the country are actually wet for a lot of the year. Despite this, Portugal just isn’t designed for the rain. You’ll see this on the pavements in Portugal, which get incredibly slippery when they’re wet. You’ll also notice that there’s not a lot to do in Portugal when it rains. There are also a lot more accidents on the roads when it rains. Whether this is that the roads don’t cope well with the rain or that the Portuguese themselves aren’t great at driving in the rain is up for debate. Either way, you’re much more likely to get in an accident when it rains. Portugal has quite a few electronic toll roads, which are a great idea in theory but paying for them can be confusing and often time-consuming as it often involves a trip to the post office. If you’re renting a car, the easiest thing that you can do is hire a transponder device for your car from the car rental company. This normally costs €1-2 per day, plus the cost of the tolls which is automatically deducted from your credit card whenever you use them. You don’t have to rent the transponder device, of course. You can avoid the toll roads altogether, or you could use them and sort out payment at the end. Don’t worry: there’s an entire article dedicated to (hopefully) explaining the Portuguese toll roads. Foreign bank cards, both credit and debit, don’t always work in Portugal, and I’ve found this to be the case at the electronic tolls and also at the prepay petrol pumps (normally the card readers in the actual station work fine, though). As a general rule, I normally try to have some cash on me at all times in Portugal and especially when I’m driving. If you forget to bring some with you, most petrol stations have a small ATM inside. In Portugal, you’ll sometimes see people standing by empty parking spaces who are waving and pointing them out to you. Yes, these people want money for their service and it’s up to you whether you pay them or not. Most people give a euro or two which, is much cheaper than risking your car getting scratched. In Portugal, double parking is quite common. Normally this is just temporary, particularly if the driver is making a delivery or picking someone up, but occasionally it’s not. All you need to do is indicate and carefully drive around them. It’s illegal to cross the road to park in Portugal and, when you park, your car should be facing the direction of travel. If you see a good space on the other side of the road, you’ll need to find the next roundabout or place that you can legally turn and cross over to the other side of the road. Portugal has a very confusing roundabout law: the furthest right lane can only be used if you’re taking the first exit. This means that, if you’re going straight over and it’s a 2-lane roundabout, you can only use the right lane if it’s the 1st exit on the roundabout. It’s quite rare that the “straight over exit” is the 1st exit on a roundabout (normally it’s at least the 2nd) so, as a general rule, you should use the middle lane for going straight over. It’s quite common to find a pedestrian (zebra) crossing at the end of the road, just as it connects to the roundabout. This isn’t so much a problem when you’re joining the roundabout, but it’s something to watch out for when you’re coming off the roundabout. 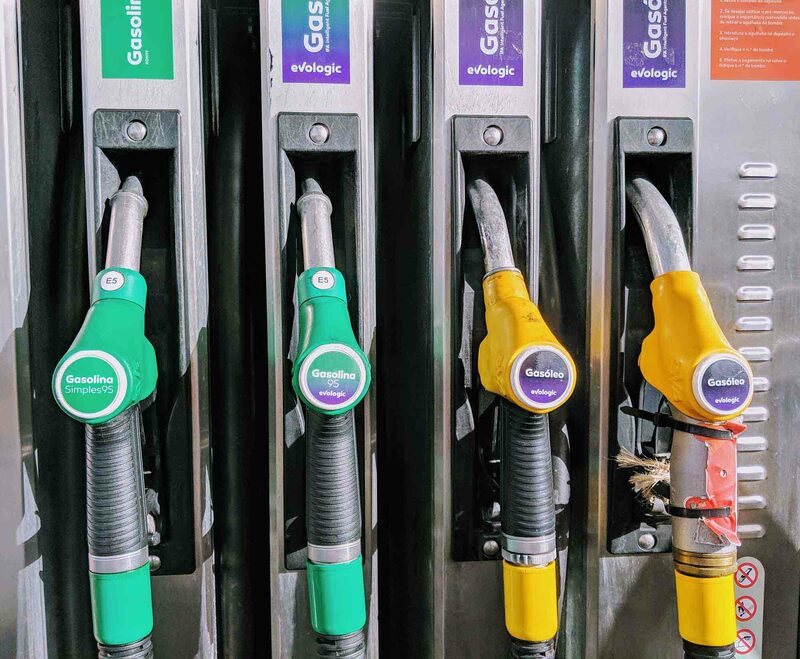 In Portugal, petrol is gasolina and diesel is gasóleo. The petrol handle is also normally green while the diesel handle is normally yellow. If you’re driving to Portugal through Spain, it’s worth filling up in Spain as fuel there is much cheaper than it is in Portugal. Many Portuguese people who live near the Spanish-Portuguese border regularly drive across to fill up their cars. Modern cars can be confusing so, if you can, familiarise yourself with the car before you set off. It’s much better to get to grips with the car at the car rental area than on the road. I’ve had a few confusing cars over the years: one where I couldn’t work out how to start it (I had to press the clutch and brake together while turning the key), and the other where I couldn’t work out how to reverse (there was a button under the gearstick handle). Regardless of what the quirk is, these things are best discovered at the car rental section of the airport and not on the road. Normally car rental companies will show you the car and, together, you’ll mark down all the bumps and scratches. This doesn’t always happen, though, which is why it’s always important to take photographs of the car while it’s still in the car rental premises. If you notice any marks that aren’t noted on your rental agreement, be sure to speak to someone before driving away. Some parts of Portugal, like Madeira and parts of the Douro and Northern Portugal, are exceptionally hilly and it might be worth spending a little more on your rental car and getting something with a bigger engine. You don’t have to spend a lot more necessarily, just don’t go for the cheapest option. If you’re planning on crossing the border, and driving to Spain, check that your rental agreement covers that. Most car rental companies only insure you to drive in Portugal. If you want to drive in Spain, you’ll need to purchase an insurance add-on that allows you to do so. This normally shows as one of the upsells like babyseats and a GPS system just before you pay for your rental car online. In Portugal, and in most of Europe, most people drive manual (stick shift) cars. 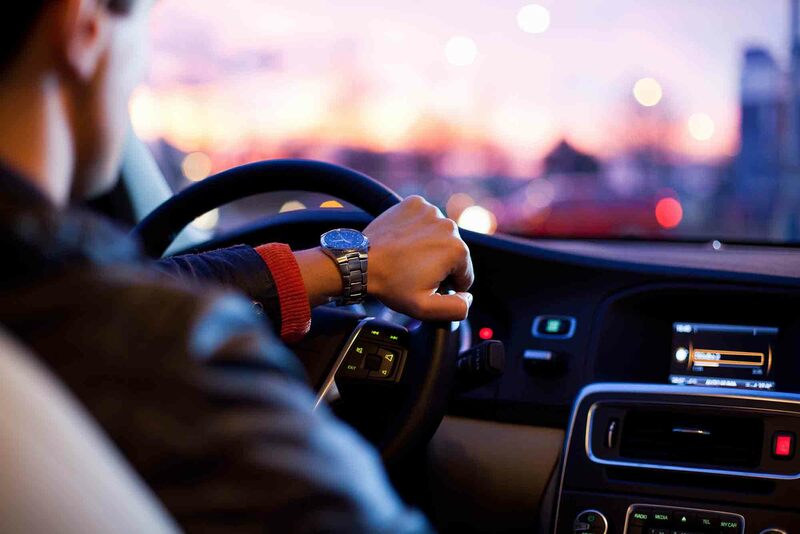 Car rental companies tend to only stock manual cars as well, although most of the larger car rental companies will have a handful of automatic cars available. Handful is the keyword here. There are very few automatic cars in Portugal so, if you think you’re going to need one, be sure to book in advance as they go quickly. Not something I know enough about, I’m afraid. I know of people who have imported cars from other European countries, and that can be complicated. I imagine it would be best to find a company that can help you do this and get a quote rather than trying to do the paperwork yourself. Hi James, i’m from Australia & I’m heading to the UK next week and am going to buy a Campervan which i’m then going to drive from the calais crossing to Brussels, Paris, Geneva, Lake Como, Milan, through the south of France across to San Sebastian on to Portugal (Porto I’d say). Helluva a journey ahead, Aiming for it to take around the 4 week mark. Any advice, recommendations tips would be muchly appreciated mate. Also as far as getting insurance goes, what is the needed policy if you know ? That sounds like an incredible trip. As far as insurance goes, it should be pretty straight-forward because you’re staying within Europe and you’re only going to be out of the UK for a month (I assume you’re going back soon after Portugal/selling the camper?). For cars, there are some limits on how long you can spend outside of the UK. Normally 90 days, but sometimes 180 days. I imagine it’s a bit longer for campers (I think you can get 365 day motorhome insurance). Brexit might affect all of that one day, but if your trip is only for 4 weeks or so it shouldn’t be anything to worry about.